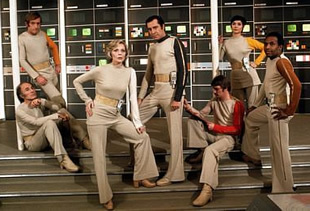 In the futuristic year of 1999, the residents of Earth have established a scientific research center on the lunar surface called Moonbase Alpha. The 311 men and women that staff the base conduct experiments and oversee the nuclear waste storage facility on the dark side of the moon. As the series begins, handsome John Koenig (Martin Landau) takes over as the commander of the station. He is being pressured by his superiors to, among other things, uncover the reasons for some of the base’s personnel becoming suddenly and violently insane and then dying. The beautiful and widowed Chief Medical Officer, Doctor Helena Russell (Barbara Bain), is convinced that radiation is causing the brain damage but cannot find evidence to support her theory. John’s old friend and the base’s Chief Science Officer, Doctor Victor Bergman (Barry Morse), confirms that there is no radiation from the waste dump. It’s uncovered that an old waste dump underwent a magnetic storm and that the affected astronauts passed over it to get to the active site. Koenig and his team uncover the problem but it’s too late. The buildup of magnetic radiation detonates the waste dumps in a massive thermonuclear explosion. The chain reaction rips the moon from its orbit and it’s sent, with its residents, hurtling into deep space. Stranded on a virtual spaceship, the staff encounter strange worlds, metaphysical phenomena, and unusual alien civilizations as they travel to strange galaxies. In season two, we find that Victor has died and previously unseen Security Chief Tony Verdeschi (Tony Anholt) has a more prominent role in the base’s operations and explorations. In their journeys, the Alphans encounter Maya (Catherine Schell), a shape-shifter from Psychon that joins them in their journey to find a new home. Maya becomes the base’s science officer and she and Tony quickly develop an attraction for one another. Other crewmembers of note include chief pilot Alan Carter (Nick Tate); data analyst Sandra Benes (Zienia Merton); main mission controller Paul Morrow (Prentis Hancock); computer operations officer David Kano (Clifton Jones); base operations officer Tanya Alexander (Suzanne Roquette); pilot Bill Fraser (John Hug); and Helena’s medical colleagues, Doctor Bob Mathias (Anton Phillips), Doctor Ben Vincent (Jeffrey Kissoon), and Doctor Ed Spencer (Sam Dastor).